The Belkin Portable Tablet Stage lets you take advantage of the inherent capabilities of your tablet or smartphone at a fraction of the price. It positions your mobile device to record video or capture images of objects, textbooks, or documents. And its portable, folding design makes it easy to carry with you, so it's available whenever and wherever you need to teach a class or make a presentation. Set up the Stage and connect your tablet to a display system such as a projector, monitor, or HDTV, and you're ready to share real-time images and notes with your audience. 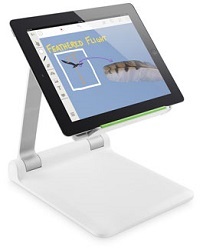 Setting up and using the Belkin Portable Tablet Stage is a breeze -- just connect your tablet or smartphone to a display system such as a projector, monitor or HDTV, launch the Belkin Stage app, and you're ready to share real-time images and notes with your audience. iPad 3rd gen, iPad 2, iPad (Original), iPad mini, iPad 4th gen, iPad Air, iPhone 4/4S, iPhone 3/3GS, iPhone (Original), iPhone 5/5s, iPhone 5c, Galaxy Tab - 10.1", Galaxy Tab - 8.9", Galaxy Tab - 7", Galaxy Tab 2 - 10.1", Galaxy Tab 2 - 7", Galaxy Tab 3 - 10.1", Galaxy Tab 3 - 8.0", Galaxy Tab 3 - 7.0", Galaxy Note, Galaxy Note 8.0, Acer Iconia, Kindle/Kindle Touch, Kindle Fire, Kindle 3/3G, Kindle HD Fire 7", Kindle HD Fire 8.9", Kindle Paperwhite, New Kindle Fire HDX 8.9", New Kindle Fire HDX 7", New Kindle Fire HD 7.